S.R. makes available G.D. Honest Lathe machine which is most up to date yet simplest design and robust construction ensures precise performance, easy operation and higher productivity. Slideway Slant Angle: 60 Deg. Tasa Micro Spm Pvt. 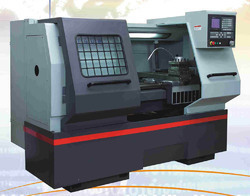 Ltd.
We are a prime CNC Lathe Machine Supplier in countrywide market. CNC Lathe Machine offered by us is suitable for lath as well as mass production. We offer CNC Lathe Machine in various dimensions and specifications in order to tune in to various needs of the clients. We are providing different kinds of Heavy Duty Flat Bed CNC Lathes which contains an auto centralized lubricating system, imported from Japan. These could be availed in various specifications and the hydraulic oil pump, hydraulic pump and hydraulic systems are of Taiwan Chaotian brand. Top Team Machines Pvt. Ltd.